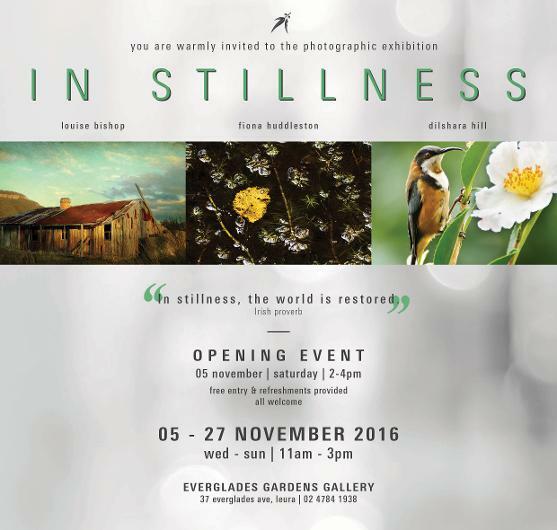 In the upcoming exhibition "In Stillness", I will be exhibiting a selection of bird photographs. My work aims to capture the tranquility of bird watching and delicate detail of the bird life around us. Together with Blue Mountains photographers Louise Bishop and Fiona Huddleston we each explore the concept of stillness. Our works range from monumental mountain landscapes to exquisite native bird life to impressionistic interpretations of the landscape. The breadth of style and subject matter will give visitors to the exhibition a chance to join with the photographers in experiencing the concept of stillness in a myriad of forms. All are welcome and the opening event has free entry.